BANGKOK , Jul 16 2018 (IPS) - Thailand’s industrial sector must focus on sustainable and green development to remain competitive in the region. “It is more expensive to operate in Thailand than other neighbouring countries. If we don’t develop smart cities, it will be more difficult for us to attract foreign investors,” Global Green Growth Initiative (GGGI) programme manager for Thailand Khan Ram-Indra told IPS. GGGI is an international organisation that works with developing and emerging countries to create programmes according to a sustainable green growth model. 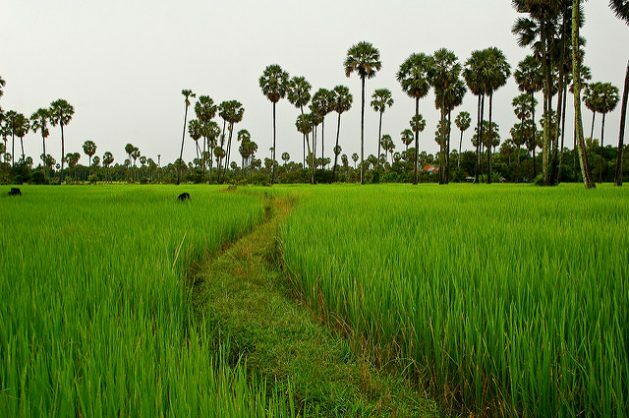 Thailand has seen an increase in awareness of green growth from public and private sectors in recent years under the government’s Thailand 4.0 initiative — an economic strategy that seeks to transform the nation’s economy from one reliant on manufacturing to a value-based economy focused on innovation, higher technologies and green industries. At the heart of this ambitious endeavour is Thailand’s industrial sector. As the second-largest economy in Southeast Asia, the industrial sector accounts for almost 40 percent of the country’s GDP. It also happens to be a significant contributor to pollution and reduced energy security within the country. The sector alone accounts for 37.1 percent of the country’s total energy consumption, while 27.9 percent of greenhouse gas (GHG) emissions are attributed to its operations. According to GGGI’s study to support the government’s climate change master plan, it finds that this translates to a net economic loss of roughly USD900 million to the Thai economy. “This issue is quite new and the industry might not have a clear idea on how to approach it. This is where GGGI can come in to help guide them. The other thing is that we can help to identify bankable projects to achieve their green vision. This is where GGGI plays a critical role in mobilising private finance and developmental projects,” Ram-Indra said. The industry has also experienced difficulties, with an economic slowdown between 2015 to 2016, labour shortages and depleting natural resources. However, the investment outlook is more positive this year thanks to a boost in investment in industrial estates through the government’s approval of the new Eastern Economic Corridor (EEC) law in late February. The USD45 billion EEC project in the country’s industrial east is the latest in a series of measures rolled out to stimulate investment in the Thai economy and is projected to generate USD39 billion over the next decade. Ram-Indra believes the EEC will provide significant potential and growth for the sector, but also warns that to maintain its competitive edge, the industry needs to look towards green investments. Ram-Indra sees the creation of more sustainable industrial parks as an enhancement to the bottomline. GGGI estimated in their roadmap to support Thailand’s climate change master plan that the Thai economy can potentially save about USD100 million if the manufacturing sector implements GHG reduction projects. The sector’s potential for green improvements is one of the main reasons why the organisation chose to work closely with industrial estates, Ram-Indra explained. Furthermore, the policy is also in line with working towards Thailand’s commitment to the Paris Agreement by cutting its GHG emission by 20 to 25 percent by 2030. In its most recent effort on Jul. 12, GGGI signed a memorandum of understanding with one of Thailand’s largest industrial estate operator’s, AMATA Corporation PCL. 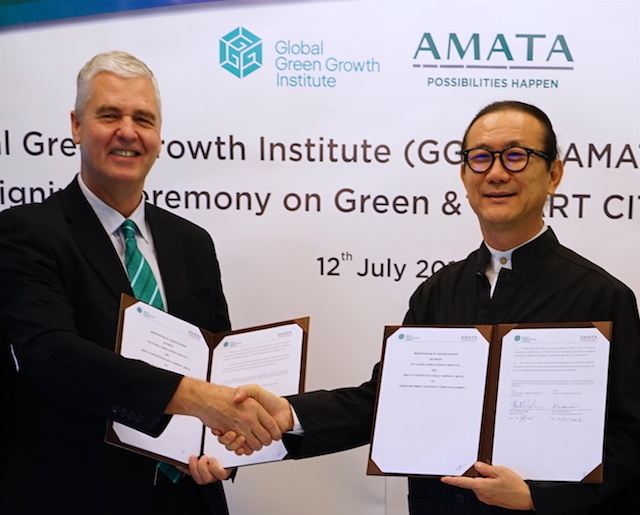 Under the MoU signed by GGGI’s Director-General Dr. Frank Rijsberman and AMATA’s CEO Vikrom Kromadit, AMATA will be GGGI’s first partner from the private sector in implementing its green city development programme. “With AMATA, we want to demonstrate that industrial estates can be very different. The Industrial Estate Authority of Thailand (IEAT) is doing some interesting developments to improve the quality of these places and certain environmentally projects. But we think the vision for the industrial estates can be radically different. They could be zero-carbon or zero-waste. There are great places to cut down the commuting time,” Rijsberman told IPS. “Not only is the environment improved, but the quality of life for those people. We think these industrial estates can be model smart cities. We want to demonstrate that they can still be commercially attractive investments but have a radically different impact on the people’s quality of life and environment,” he said. “AMATA is interesting to us because we also have states in Vietnam where there are about 230 of these special economic zones. They are just starting in Laos and Myanmar. Our intent is that once we demonstrate to AMATA how this can work, it should have an impact on industrial estates in Thailand and throughout the region. “We are doing other projects along the same line in Vietnam, our green investment specialist is working with a company to install solar roofing in the park and helping them to work with banks and working out the best business model. The idea is if one is successful, then it can really scale,” Rijsberman said. For Kromadit, the future of the country’s development depends on having a smarter and better facility environment. He hopes the MoU will help push future developments to see environmental issues including access to greener spaces on top of reducing pollution as incentives for investment in the EEC. GGGI’s work also considers the societal aspect affecting the community and workforce in and around the industrial estate. “We are looking to improve the quality of life for those people including cleaner air, lessening their transportation time and overall improving the standards of living,” Ram-Indra said. Thai manufacturers and industrial estate operators should take confidence in the transition towards eco-industrial developments by looking towards one of its biggest competitors, Indonesia. A recent study by consulting firm Solidiance showed Indonesia’s top five green industrial parks have produced encouraging results. Companies that have reused their water were able to decrease 10 to 15 percent from costs for purchasing new water and lowering their production costs. Cost saving on energy maintenance can reach up to 7 to 15 percent by employing green technology such as solar cells and LED lights. The study also projected that green space could generate a higher return for the company in the long run (over 50 years). One industrial city marketing manager noted that in addition to continued engagement between stakeholders and the local community, the community benefitted from better housing. IEAT has implemented a similar programme with the Map Ta Phut Industrial Estate. The programme reported an improvement in public sentiment towards the industrial sector and enhanced cooperation between communities and more companies adopting environmentally and socially responsible mechanisms in their businesses. Tara Buakamsri, Country Director, Greenpeace Southeast Asia, told IPS he would like to see greater community engagement in the IEAT programmes. Ram-Indra hoped the success of the AMATA partnership and other sustainable industrial parks would not only signal other companies to follow suit, but also act as a model for other countries especially those in the Southeast Asia region. “My concern is that the change is not happening fast enough. There needs to be a bigger push from all the stakeholders involved,” he said.